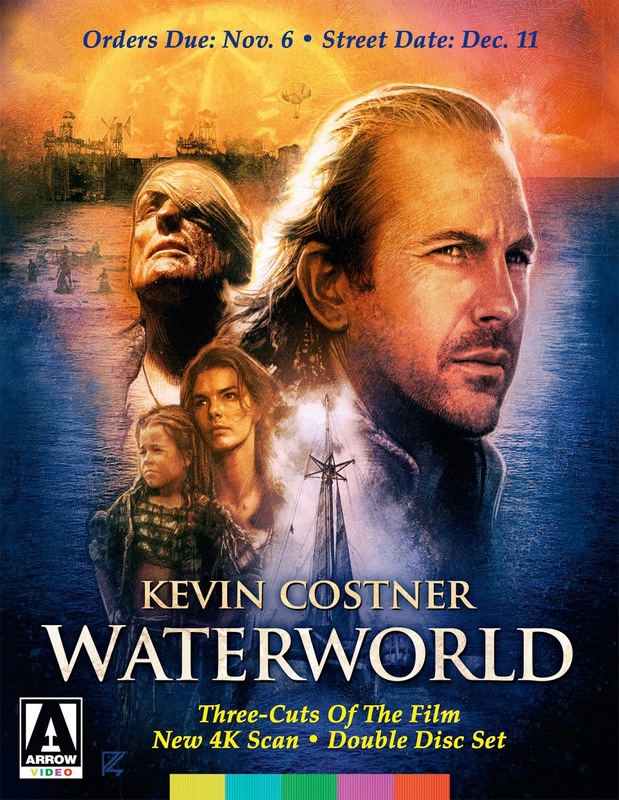 Arrow Video, with domestic sales and distribution expertise provided by MVD Entertainment Group, has a new 4K scan (from the original negative) of director Kevin Reynolds’ 1995 futuristic thriller, Waterworld … and Waterworld … and Waterworld planned for Blu-ray release on Dec. 11. Kevin Costner is certainly going to be waterlogged with so many Waterworld presentations, but that’s exactly what Arrow Video has planned — three different cuts of the film! There will be the original theatrical cut, the extended television cut (clocking in at an extra 40 minutes) and the extended European “Ulysses” cut, which includes censored shots and dialogue (171 minutes). But wait, there’s more!!! Arrow Video has also included in this double-disc collection the newly-prepared feature-length making of documentary titled Maelstrom: The Odyssey of Waterworld. Also counted among the bonus nuggets are a vintage making-of featurette and the featurette titled “Global Warnings,” hosted by film critic Glenn Kenny.